Which group of muscles elevates the first two ribs and flexes and rotates the neck? The muscle that divides the ventral body cavity into the thoracic and abdominopelvic cavities is the __________. Which of the following muscles does the phrenic nerve innervate? The supraspinatus is named for its location on the posterior aspect of the scapula above the spine. What is its action? Which muscle(s) is (are) contracted to exhale forcibly? Which of the following is not a muscle primarily involved in the breathing process? The ________ runs deep to the internal oblique. The abnormal protrusion of the small intestine through a weak point in the muscle of the abdominal wall is called a ________. Which of the following muscles fixes and depresses the ribs and stabilizes the pelvis during walking? Which of these muscles is visible in the figure but NOT indicated by a letter? Which muscle originates on the pubic crest and symphysis and inserts on the xiphoid process and costal cartilages of ribs V through VII? Identify the action of the muscle at A.
Donna was rushing to class and slipped on a patch of ice and fell backward. An x-ray revealed a broken coccyx. All the associated muscles were bruised. Which muscles were they? A young pregnant woman went to a childbirth class and the instructor informed them about strengthening the muscles of the pelvic floor. What are these muscles, and why should she strengthen them? Coccygeus and gluteus maximus; strengthening these muscles helps in correctly positioning and orienting the child prior to birth. Perineal muscle, levator ani, and coccygeus; strengthening these muscles helps in the delivery of the child by resisting downward forces when "pushing." Ischiocavernosus, coccygeus, and gluteus maximus; strengthening these muscles helps in correctly positioning and orienting the child prior to birth. Gluteus maximus, coccygeus, and levator ani; strengthening these muscles helps in correctly positioning and orienting the child prior to birth. Levator ani and coccygeus; strengthening these muscles helps in the delivery of the child by resisting downward forces when "pushing." A nurse can facilitate respiratory functioning by encouraging deep breathing exercises such as diaphragmatic breathing. What is diaphragmatic breathing? It is the contraction of the external intercostal muscles to lift the ribcage, aiding inspiration. It is the alternating contraction and relaxation of the diaphragm, causing a decrease in pressure in the abdominopelvic cavity and facilitating blood flow to the heart. It is the alternating contraction and relaxation of the diaphragm, causing an increase in pressure in the abdominopelvic cavity and facilitating blood flow to the heart. It is the alternating contraction of the external and internal intercostals muscles to aid inspiration and expiration. It is the contraction of the internal intercostals muscles to depress the ribcage, aiding expiration. Identify the levator ani muscle. What is the name and origin of the muscle at A? Which muscle is innervated by the S3 nerve, S4 nerve, and the inferior rectal nerve (a branch of the pudendal nerve)? Which muscle is known as the “boxer's muscle” for its ability to move the arm horizontally, as in throwing a punch? The ________ is known as the "boxer's muscle." Which muscle is a prime mover of arm adduction? Which of the following is NOT a rotator cuff muscle? Which of the following describes the suprahyoid muscles? They depress the larynx and hyoid bone if the mandible is fixed. They are often called strap muscles. They are a group of muscles that lie superior to the hyoid bone and help form the floor of the oral cavity. They move the pharynx superiorly during swallowing. 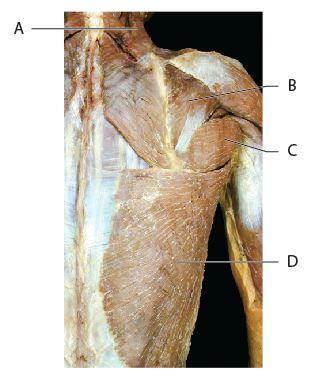 Which of the following muscles is shown on this image but is NOT indicated with a letter? Which of the following letters represents the infraspinatus muscle? 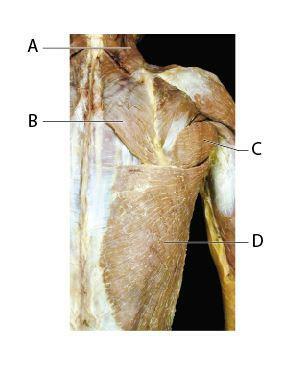 Which letter represents the biceps brachii muscle? Which of the muscles indicated by letters has action at only one joint? Which muscle is an antagonist to the biceps brachii muscle? 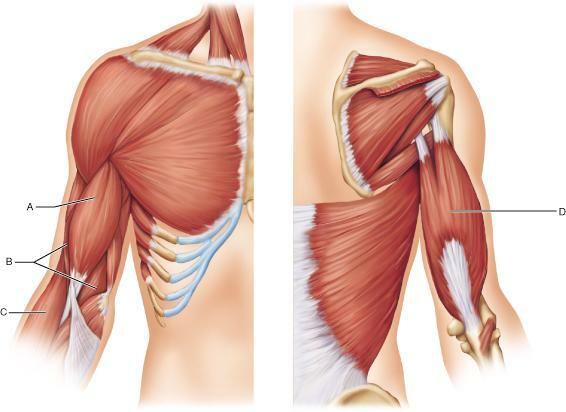 Which of the following muscles is not a rotator cuff muscle? A reduction in the lateral angle of the glenohumeral joint in relation to the anatomical position would be called __________. Movement of the shoulder laterally away from the body is called __________. The transversus abdominus muscle is innervated by the __________. Which joint is considered the most flexible joint in the body? 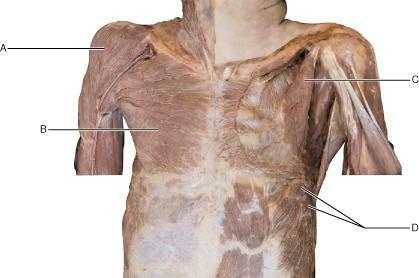 Muscles of the shoulder can be divided into groups based on __________. 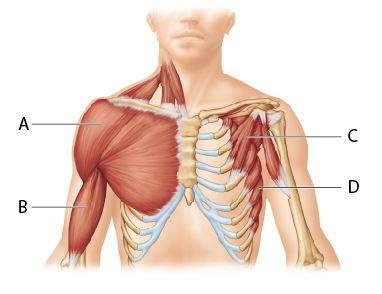 Which of the following groups of muscles are not muscles of the shoulder? The gluteus medius muscle is innervated by the __________. 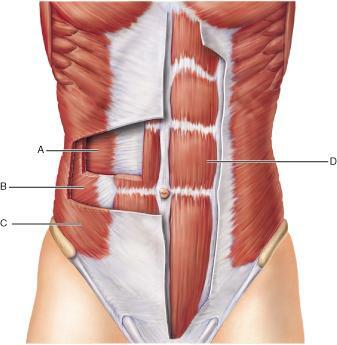 The origins of the rectus abdominus muscle are on the __________. The origins of the lateral head of the gastrocnemius muscle are the __________. The gastrocnemius muscle is innervated by the __________. The two heads of the gastrocnemius muscle converge to insert onto __________. The origin of the external obliques includes ribs __________. The majority of the fibers of the gluteus maximus insert onto the __________. The gluteus maximus is the most powerful muscle during __________. The actions of the internal intercostals are most important during __________. The actions of the internal obliques include __________. The insertion of the pectineus muscle is __________ and on the __________. The pectineus muscle __________ the thigh and is innervated by the __________ nerve. The rhomboid minor muscle sits __________. The deltoid muscle fibers are separated into __________. The middle fibers of the deltoid muscle __________. The latissimus dorsi inserts __________. One of the actions of the latissimus dorsi muscle is to __________. All fibers of the triceps brachii are innervated by the __________. The infraspinatus inserts on the ____________ of the humerus. The infraspinatus muscle is included in the __________ muscles.